When it comes to putting lights on an artificial Christmas tree, it can become stressful and time consuming. It is probably the most difficult bit while decorating the Christmas tree. The key to putting lights on an artificial tree is to somehow untangle them and make them work before you put them on the tree. 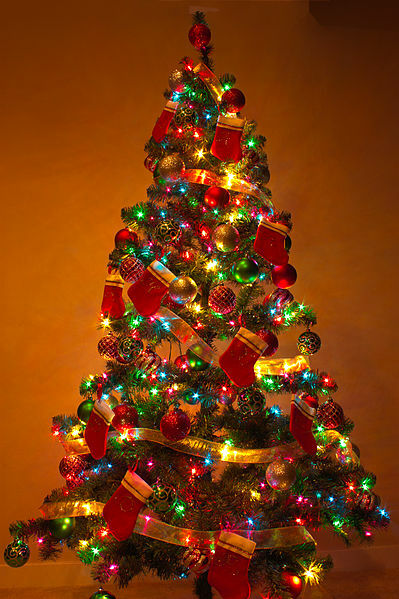 You must try to wrap the lights around every branch so that your tree can shine brightly and can be evenly decorated. Moreover, this will also help you prevent any tangled wires and you will easily take these lights off once Christmas is over. Start off by untangling each and every Christmas light at your disposal. You must make sure that none of these lights are tangled or knotted up. Make sure that each and every Christmas light you have is in working condition. Start plugging in each string of lights so you can know which is working and which is not working. Go over every single strand of light and check for the missed bulbs. Once you have untangled all the strings, it is time for you to start decorating. Always start from the bottom of the Christmas tree. Wrap the string of lights around one branch at a time. Start from the base of the branch and then wrap the light around the branch from its corner to the edge of the branch and then move back to the base. Once you have reached the base, move the strand to the next branch and repeat the previous step again. Keep repeating the same step over and over again until you have covered all the branches. The key is to move up slowly after you have completed the lower level of branches. Once the string of lights ends, you must attach the new one with the previous one. This is going to form a uniform pattern for the lights. After attaching the new strings, continue with the wrapping bit. Remember to move to upper levels slowly. Keep wrapping the lights around the top branches of the tree and keep going up. Once you reach the top of the three, hold the string there. If there are a few lights left, let them hang behind the Christmas tree. You can use that string to attach other ornaments and garland while decorating your tree. Switch on the lights and see how they look.